Survivor: Heroes v Healers v Hustlers (2017) - 2nd place, two jury votes. Received two jury votes, to finish 2nd (5-2-1) in Episode 14, "Million Dollar Night" (Day 39). Heroes v Healers v Hustlers Ep. 1 RC: "Quest for Fire" - Holds the torch, lights it just barely after the Healers (2nd*/3). Heroes v Healers v Hustlers Ep. 1 IC: "Tracks of My Tears" - Works table maze with Ben, falls just short of safety (3rd/3). Heroes v Healers v Hustlers Ep. 2 RC/IC: "Tracks of My Tears" - Works the puzzle with Alan; Heroes don't lose! (2nd*/3). Heroes v Healers v Hustlers Ep. 3 RC/IC: "Rock In a Hard Place" - Crosses barriers, stacks the blocks, Heroes win! (1st/3). Heroes v Healers v Hustlers Ep. 4 RC: "Tangled Up" - Now with new Soko, works the puzzle with Ali, but Soko loses. Heroes v Healers v Hustlers Ep. 4 IC: "The Color and the Shape" - Hauls, unlocks the locks; Soko doesn't lose (2nd*/3). Heroes v Healers v Hustlers Ep. 5 RC: "Head Long Flight" - Sits out, as Ryan struggles and Soko loses (3rd/3). Heroes v Healers v Hustlers Ep. 5 IC: "Rice Race" - Moves the rice, tries, fails to place a ball; Soko loses (3rd/3). Heroes v Healers v Hustlers Ep. 6 RC: "A-Tension Span" - Helps move the boat; watches as Soko wins! (1st/3). Heroes v Healers v Hustlers Ep. 6 IC: "Discy Business" - Holds the rope, stacks blocks, but Soko loses (3rd/3). Heroes v Healers v Hustlers Ep. 8 RC: "Air Raid" - Misses on her one shot, wisely swaps out for JP; blue team wins. Heroes v Healers v Hustlers Ep. 9 RC: "Hear About It Ladder" - Climbs the ladder, retrieves a buoy; red team wins. Heroes v Healers v Hustlers Ep. 11 RC: "Kenny Log-Ins" - Works the puzzle with Mike, but the red team loses. Heroes v Healers v Hustlers Ep. 13 RC: "The Bottom Line" - With Devon, half of the winning team. Heroes v Healers v Hustlers, Ep. 7 IC: "Will It Go Round" - Tenth person out, just outlasting Cole (3rd/12). Heroes v Healers v Hustlers, Ep. 8 IC: "Ten Foot Pole" - Seventh person to drop out (5th/11). Heroes v Healers v Hustlers, Ep. 9 IC: "Squatty Probst" - Lasts an impressive 20 minutes, but doesn't win (4th/10). Heroes v Healers v Hustlers, Ep. 10 RC: "The Game is Afoot" - Has multiple blocks on top layer, doesn't win (4th/9). Heroes v Healers v Hustlers, Ep. 10 IC: "Bermuda Triangles" - Lasts 20 minutes, drops out in transition to top rail (5th/9). Heroes v Healers v Hustlers, Ep. 11 IC: "Driving Wheel" - Races to place letters in final word, Chrissy wins! (1st/8). Heroes v Healers v Hustlers, Ep. 12 RC: "Love on the Rocks" - Chrissy & Keith pick the same rocks twice, win (1st/7). Heroes v Healers v Hustlers, Ep. 12 IC: "This Much" - Lasts 15 minutes, but second to drop out (6th/7). Heroes v Healers v Hustlers, Ep. 13 IC: "Franklin's Tower" - Makes a comeback on the puzzle; Chrissy wins (1st/6). Heroes v Healers v Hustlers, Ep. 14 F5 IC: "Might As Well Jump" - Races Ben on the puzzle; Chrissy wins (1st/5). Heroes v Healers v Hustlers, Ep. 14 F4 IC: "You Shook Me" - Drops her tiles a few times, but Chrissy wins (1st/4). Heroes v Healers v Hustlers, Ep. 1: Receives the Ep.1 Super Idol from Ryan; declines to play it. Heroes v Healers v Hustlers, Ep. 5: Roark Luskin (voted out, 3-2). Heroes v Healers v Hustlers, Ep. 6: Ali Elliott (voted out, 3-1). Heroes v Healers v Hustlers, Ep. 7: Jessica Johnston (voted out, 7-5). Heroes v Healers v Hustlers, Ep. 13: Ashley Nolan (voted out, 5-1). Heroes v Healers v Hustlers, Ep. 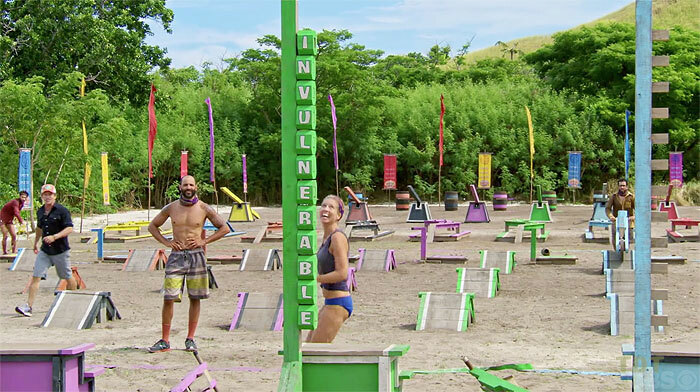 5: Two votes, from Ali and Roark. Heroes v Healers v Hustlers, Ep. 7: Five votes, from Cole, Desi, Jessica, Joe, and Mike. Heroes v Healers v Hustlers, Ep. 14: Received two votes, from Ashley Nolan and Mike Zahalsky, to finish second (5-2-1). This is not a dictatorship! We have to draw marbles? Wait, Ben has a real idol? Also gets this brand-new "advantage"
Josh Wigler at The Hollywood Reporter (9/4/17): "Player Profile: Meet Chrissy Hofbeck"
Josh Wigler & Rob Cesternino at RHAP (9/15/17): "Pre-season interviews with Chrissy Hofbeck & Mike Zahalsky"
Gordon Holmes at XfinityTV.com (12/21/17): "Ryan and Chrissy: 'I Think We Both Would Have Voted for Ben to Win'"
Mike Bloom at Parade.com (12/21/17): "Chrissy Hofbeck and Ryan Ulrich Crunch the Numbers and Give Tips"
Dalton Ross at EW.com (12/21/17): "Chrissy says she was not robbed"
Rob Cesternino at RHAP (12/21/17): "Final 5 Exit Interviews - 12/20/17"
"Hobbies: Adventure travel, any kind of puzzle, and cheering on my kids at their sports and activities. Pet peeves: When someone doesn't hold a fork correctly and eats like a caveman. What's your personal claim to fame? I've traveled through all seven continents! I'm proud of having graduated from Penn (as a math major!) and MIT. And mostly, I'm really proud of the three incredible humans that my husband and I have raised. If you could have three things on the island, what would they be and why? A photo of my family since they'd get me through the super tough days, a blanket because I hate being cold, and tweezers. 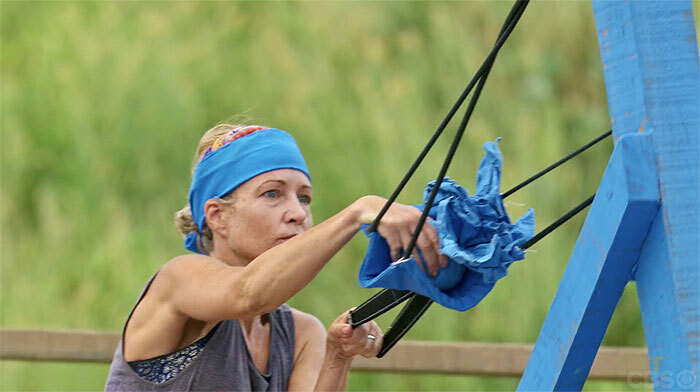 Which Survivor contestant are you most like? Probably Tai Trang. He falls in love with everyone but gets cut-throat when he needs to. Or Spencer Bledsoe, who never gives up or stops looking for cracks. 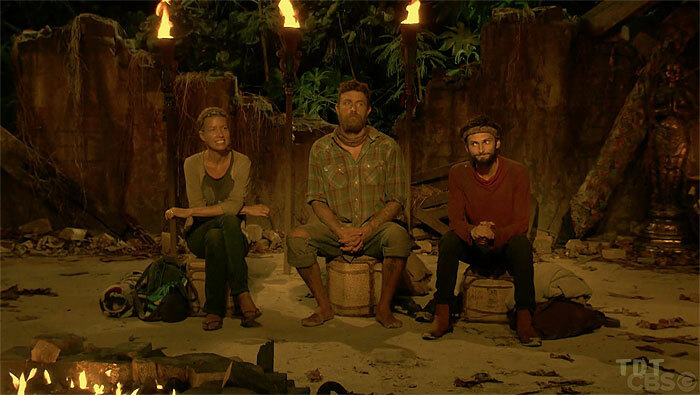 Why do you think you'll "survive" Survivor? I am smart, lovable, and driven, and people like to help me, a combination that has led to great success. I get along with everyone, work hard, and always think "I can do it!"